Kinkiest Magic card art ever? I feel bad for using a MaRo-type puny title; it must be all the designing I did this weekend. Yes, with GDS2 now at a pause between rounds 3 and 4 where the final 101 will cut to the Top 8, we can go back and take a look at what we did and over-analyze and complain that we should’ve had more time. Let me make this clear: I doubt any one of us who entered is a professional card designer. Our entries were as polished as they were going to get with the time constraint and knowledge we all had. I want to thank everyone for helping me out. Hopefully Team Color Pie will continue on and a Top 8 will be in sights and I’ll need even more of your help. But for now, let’s talk about design since I learned quite a bit this weekend. If you didn’t see any of the wiki or discussions, this will help you understand at least the process of the whole situation. And no, this isn’t going to score me more points on the GDS2, this is just a cathartic release after a few intense days. I don’t know how MaRo can keep it bottled up for 18 months, but I’m willing to learn. Most of the time if you’re designing for fun you think that every idea you come up with is the best. My philosophy is that you want more eyes bouncing off stuff because they’re offer up ideas and say how something just doesn’t work. That’s what happened with one of the main mechanics I pitched. Pure – If ~This~ was cast with one color of mana, it gets +3/+0 and haste until end of turn. So, if you cast Hot Goblin at 2R, you’d still get a 2/1. If you cast him at RRR, he’d be an Arc Runner, that didn’t have the sacrifice clause, but became a 2/1 at the end of the turn. It’d be something that mono-red decks would love to play and be good in limited. The text is easy to template, and it makes sense. More cards were being created and as I was mocking some up, I was thinking of a twist upon Pure. Pure – For Each R spent to cast ~this~, it gets +1/+0 until end of turn. If it was cast with one color, it gains haste until end of turn. The main issue of Pure 1.0 is what happens when you don’t have all the mana to cast it? While there was going to be some mana fixing and altering in the block (I submitted what might be my favorite twist on it as an artifact), not always are you going to have the mana to pay for the Pure effect. This story isn’t really about design but it’s become such a classic story (and it involves kicker) that I felt obliged to tell it once again. (And yes, I know I told it during my Invasion Week article, Body Snatchers of the Invasion.) During Invasion development I played frequently in the FFL (the Future Future League, where we play many months ahead to try and figure out what the future environment will be like). Because I wasn’t the best of deck builders (at least a Spike deck builder; I could hold my own in a Johnny world), I usually got decks from other developers. Randy Buehler was running the FFL at the time, and he gave me a red-green deck to play. In it were four Grizzly Bears. I didn’t think anything of it at the time. I then went on to go 4-0 that week. I was the only person with an undefeated record. During my last match, Randy watched. At some point late in one of the games, I played my Grizzly Bears. After the match was over, Randy informed me that the Grizzly Bears weren’t actually Grizzly Bears. They were proxies for Kavu Titan. Armed with this information, the next week I went 2-2. Suffice to say that the R&D guys thought this was the funniest thing ever. The lesson I learned was the importance of using the Kavu Titans as 2/2s. When I was aggressive with Kavu Titan, my deck performed much better. When I waited to maximize the Kavu Titans as 5/5 creatures, I lost much of the aggression of my deck and thus some of its power. Week 3, I went 4-0 again. While they’re both initially 2/2’s for 1G, Kavu Titan can be a 5/5 trample for 3GG. Most people want to achieve the maximum of the card for when they play it. There’s tension there with the Titan that it can be cast earlier, but you’ll lose the opportunity to cast it as a beater later if you do. Obviously, in an idea world, you’d want to cast it for 3GG whenever, but you can’t always live in Magical Christmasland. This brings us back to Hot Goblin. The ideal time would have it be cast as RRR for a 5/1 haste. Mono-Red decks will do that every single time. But, if you had it in limited or in a casual game where you have two Mountains and a Forest, you’ll want to keep waiting until you get that Mountain. You’ll be sitting there frustrated because you’ll want to get the best out of him and not play it. Pro tip: not everyone is a Pro and will read the situation differently. You can’t assume that everyone will play it for 2R and beat down without the bonus effect if that’s what the situation calls for. Look at the MaRo story up above; once he knew that he could cast it with the kicker, that’s all he wanted to do with it. Plus, why would you draft that Goblin if you weren’t in Red? It made no sense since he wasn’t splash-able. And if this was going to be a mechanic that saw multiple cards at multiple rarities, it was going to convince you to stay completely on one color. With 8 People drafting 5 colors, it was going to cause some really bad decks if they couldn’t get the colors early in their picks. Pure – For each U spent to cast ~this~, target player puts the top card of his or her library into their graveyard. If ~this~ was spent using one color of mana, draw a card. This time, the issue of Pure 2.0 was the scalable effect that came with the color. You’re already paying UU in the casting cost, so it’s already doing to mill for 2. Milling for 4, countering a spell and drawing a card can seem pretty good, if you’re spending UUUU to do it, that’s pretty restrictive. Even Cryptic Command only costs 1UUU. After some playing around with some of the effects, the last bonus line was cut (Which made it Pure 2.5). While in hindsight, I should’ve have kept it on one card or two that I submitted but print it on a different line, so I didn’t have to feel as if I had to include one with every Pure card out there. The bonus was a great get, but you had the problem of wanting to wait to play the card. But the scalable effects where what kept bringing me back to Pure. But it was even better then that: if you had Hot Counterspell in your hand, and two Islands and two Forests, you could still counter that spell. Yes, you could do it in the first place with Pure 1.0, but you felt that you weren’t getting ripped off of a final ability once you took off that bonus effect for a full casting of Blue. You were cutting a loss, but it wasn’t as bad. Pure – For each G spent to cast ~This~, it gets a +1/+1 counter until end of turn. Pure – For each W spent to cast ~This~, you gain 3 life. Yes. Just like almost any other keyword out there, Pure is Kicker. But, this was kicker inside of the casting cost. You could print Gold creatures/spells with them being a second color and create powerful mono-color cards that could be played in different colored decks. This also allowed the possibility of, like Hot Demon, to be played in three color decks. Paying WWGBBB gave you a 6/6 Flying Black creature that gained you 6 life. Yet, if you played it in your mono-Black deck, you could get a 5/5 flyer for 6. No, that’s not amazing stats, but it gives it flexibility. Suddenly, mana screw wasn’t that much of an issue. The only real issue with Pure was that the scalable effects have to be worth around 1 mana. The more you do, the more powerful they’re going to become. It’s going to be assumed that you’re already paying for at least one color of mana to cast a spell, so that will get tacked on as well. So stuff like +1/+1 counters and putting 1/1 tokens into play can be easy to do, it has to be controlled enough not to become over power. However, if you do go the “Full Pure”, you get a massive effect that will make it worth it. The splashy card I submitted for MaRo’s post was really splashy, and maybe in hindsight, too powerful. But, that’s for development to decide, right? Infuse was brought to one paragraph. Even though there are “Two” different versions of Infuse on the card, it was deemed less confusing if you brought it into one paragraph. Yes, that’s a colorless spell. For a while, the second option was having colorless hybrid, but without trying to pitch WotC on a new card face for that, and since I didn’t have enough time to properly go through it all, it was ditched. The story changed, but people argued that colorless could still work if Infuse was put on in. I think it looks nicely. The whole set isn’t going to have a bunch of these, but a cycle of them, like the colorless ones from Shadowmoor or the Flip cards from Kamigawa. The colorless spells were spells that any color could conceivably get, even if not very often. Pumping up your creatures as a sorcery for 3 seemed just fine and could be drafted and you won’t feel bad for it. If you’re in Green or White, it made it all that much better. And that’s how Infuse came to be. Hey, I feel just like MaRo in one of his preview articles, only less fighting against my team. While there were multiple people working on this online, I bet it doesn’t come close the to opportunity to interact with them face to face and create cards that way. Yes, I would love that chance. So, until next time, may you infuse you life with happiness. Last one, I swear. Very nice design. I hadn’t had the chance to look into what everyone else was up to, but now that I have th time I’m glad I got to read this. Good work on the mechanic and I can’t wait to see what the rest of your set looks like. One thing to point out; I didn’t illustrate the picture on the card, it is from the Alara Reborn fatpack, in case anyone was confused. 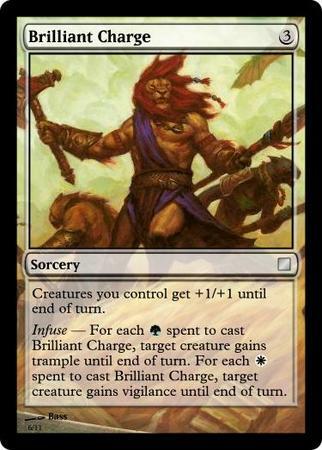 Also, I think the description of Infuse as “kicker inside the mana cost” is very, very apt. I often tried to think of how to describe it, and that’s the best so far. This was very MaRo, in a good way. There was some discussion of that, but I think that’s up to Development to refine it. This was just pitching the idea and submitting it. To get a fully created concept in such a short time is near impossible to do. In design, you’re not supposed to get everything right; if there’s something development says you can’t do, you either fix it or go back to the drawing board. There’s also the possibility of tapping for mana, then paying for the spell, which I know people do. The mana’s just sitting in your pool and you use it to pay for your spell. I think most people have taken the known shortcut of casting the spell, then paying for it. Your writing of the sequence of events leading up to the creation of Infuse and the revealing of the card in its beautiful beautiful-ness is beautiful. I felt excited when I imagined drafting Infuse cards and casting them for their Infuse effects. Very cool. Infuse does not work fine. As Brilliant Charge is currently worded, if you paid for it with, let’s say, GWW, it would give the one creature it targets trample, and then vigilance, and then a second instance of vigilance. I’m guessing that’s not what you’re after. Cankerous Thirst’s example doesn’t work, it’s worded so that you pick both targets regardless; only on resolution does it check for the mana types spent and apply the effects accordingly. Take a look at Fireball instead, since we’re dealing with a variable number of targets. You choose all the targets, then the cost itself is altered for each yadah yadah you know how Fireball works. That’s much closer to infuse. But infuse internally alters the cost instead of adding onto it like Fireball, so you can’t use that workaround. You should also take into consideration that if you pay 10 for it (there’s a lot of Grand Arbiter Augustins in play) you should be able to give ten creatures trample if all ten of it was green. That’s the best I can come up with. Still has a few problems: there is no indication to your opponents which creatures you are going to give which abilities to, making it impossible to gauge the situation and respond, and you can just target every creature on the board to make it even harder to predict. You can’t set a manual limit on the number of targets because then how would it behave if you cast it for GGGGWWWW or something? Yeah it’s still got some execution issues, but at least it now it actually does what you want it to. Designers may not be obligated to get everything right; that doesn’t mean they’re “not supposed to”. Just because you aren’t obligated to word your mechanic’s text so it actually functions doesn’t mean you shouldn’t try and fix it if you know there is something inherently wrong with what you are intending to pitch. I see your point. You are right. Infuse – When you cast CARDNAME, for each [color] spent to cast it, [effect]. This causes the infuse to become a triggered ability that goes on the stack, the targets are chosen, it resolves, then the spell resolves. The infuse should be written first because it will always resolve first. Infuse – When you cast Brilliant Charge, for each G spent to cast it, target creature gains trample until end of turn, and for each W spent to cast it, target creature gains vigilance until end of turn. Note also that this version has an uncounterable effect; it might be better to make the trigger go off on resolution, rather than on casting.